I did this walk on Sunday 7th September 2008. I drove down and parked by Wye station before taking the 9:16 train to Ashford. 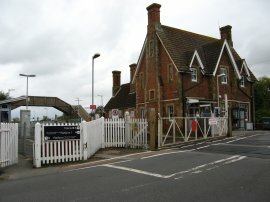 After a half hour wait at Ashford station I then took the connecting train through to Hollingbourne. The ticket had cost £6.90. From Hollingbourne Station I then retraced my steps back up to rejoin the route of the North Downs Way. As I walked back up to the North Downs Way I was accompanied by the sounds of the bells of All Saints church which was pleasant to hear, even if they did sound slightly discordant. Just as I reached the point where I had left the path last week, photo 1, it began pouring down with rain however fortunately this only lasted for 15 to 20 minutes and was the only significant rain of the day. I had been expecting wet weather and wore my new Tog 24 waterproof trousers for the first time which were quite comfortable, although a little warm for this time of year. 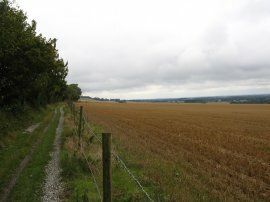 The tarmac road the route had joined soon gives way to a un-surfaced byway which runs between fields along the base of the hills of the North Downs, photo 2, which made for fairly easy level walking. 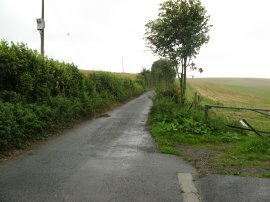 For much of the day the route was following the route of the Pilgrims Way along hedge lined byways of which photo 3 is a typical example. Despite following byways for much of the day the route seemed little used by off road traffic and I was only passed by two small groups of motorcyclists all day while on these stretches of path. Some areas of the path had been covered in gravel though, I presume to help protect the surface of the byway, which was not the best surface to walk on. Approaching Harrietsham the route a joins another surfaced section of the Pilgrims Way. The route passes above the village, crossing Stede Hill, and continuing on down a road. 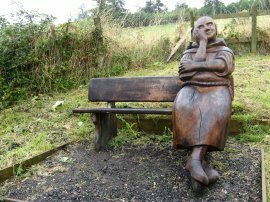 On the way I passed a bench which included a life sized carved wooden pilgrim, photo 4. 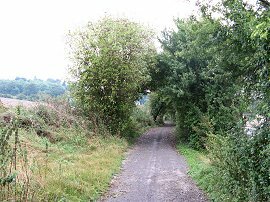 The route passes by the edge of the Marley Works, pretty much hidden behind a tall hedge and eventually, when the road bends to the right, continues ahead again along a byway. Joining another road the route heads downhill for a short distance before joining another section of byway. This runs past some houses, goes through a gate and then joins a more open grass covered section of path. 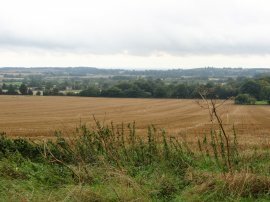 To my right there were now views over the village of Lenham, photo 5, where I had started my walk along the Stour Valley Walk a little under a year earlier. A short distance further on the route of the North Downs Way passes by the Lenham Cross war memorial, photo 6. 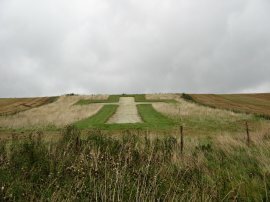 This is a of a 200-foot chalk cross carved into the scarp slope of the downs which was constructed in 1922 as a war memorial from donated funds by the village. 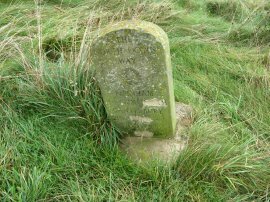 Very close to the cross was another of the North Downs Way milestones, standing slightly lopsided on the grassy ground, photo 7. This one showed I was now 92 miles from Farnham. As this milestone was on more open ground than the others that I had previously passed I was able to see that on the back of the marker there was the following writing "This milestone was placed to commemorate the work undertaken by Kent County Council and the Countryside Commission on the North Downs Way National Trail, 1993". I also spotted that someone had also tried scratching out the distance in kilometres from the milestone. From the cross the route continues along the byway before joining a road at Hubbards Hill for a short distance before once again tacking a byway that follows the route of the Pilgrims Way all the way to the village of Charing, photo 8. 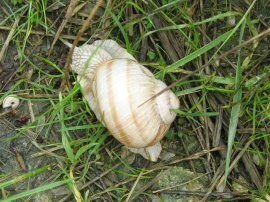 On this stretch of path I spotted quite a large number of the large Roman Snails, photo 9. 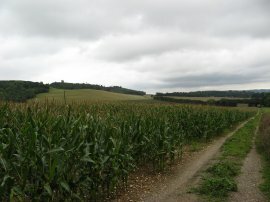 As at Harrietsham the route passes just above the village, crossing the A252 to rejoin another surfaced section of the Pilgrims Way, still making its way along the base of the North Downs. To my right I was able to catch the occasional glimpse of the tower of Charing church through the hedges and trees that lined the path. 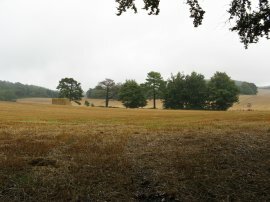 Because of the damp weather, and the rather repetitive nature of the route along the often hedge lined byways there was a large section of walk where I took very few photo's, the distance between photo 7 by Lenham Cross and photo 10 at Dunn Street being 6.5 miles! However despite the lack of specific scenic interest this was still a pleasant section of path to be walking along besides the gently rolling fields. Probably as a result of not stopping to take the number of photos that I usually do I had managed to walk the first 9 miles of this stage in 2 hours 45 minutes which is bit faster than normal, and also gives some indication of easiness of the terrain, which was in marked contrast to the previous section I had walked. 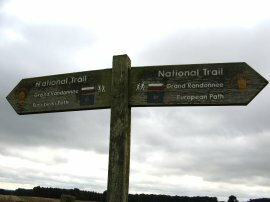 The route follows the road, which leads to the entrance to Bourne Quarry, before joining a muddy bridleway running between tall trees on the edge of woodland alongside Westwell Downs. After about a mile the route joins a road which leads to the small hamlet of Dunn Street. Leaving the road at Dunn Street I crossed the first stile of the day after almost 11 miles walking as the route joins a farm track running alongside a field of maize, photo 10. The path follows the farm track towards Home Farm before turning right to pass through a small band of trees. 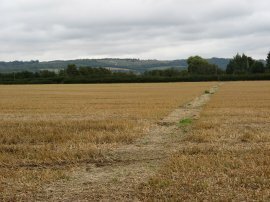 Here the route turns to the left and finally leaves the by-ways and roads to take a footpath that runs across the middle of a field that had recently been planted with broad beans. The crop had been harvested and there were lots of dried up beans lying along the route of the path. Seeing the dried up beans got me thinking that I wish I knew more about farming and the uses of the crops that I see planted in the fields. 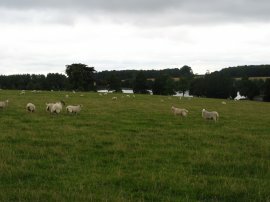 Once over the field the route joins a paved driveway, continuing ahead towards the village of Boughton Lees through the grounds of Eastwell Manor. To the right of the path the route passes close by Eastwell Lake, photo 11, and hidden in the trees just of the path the ruins of a 14th century church. Where the driveway bends to the left the route continues ahead over a grassy field, passing a North Downs Way and E2 European Long Distance route way marker, photo 12, before bearing to the left across the grassy field, down over the driveway to Eastwell Manor, and over a small field to join a road on the edge of Boughton Lees. 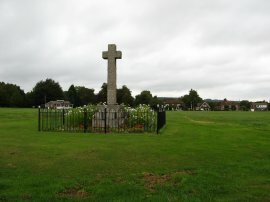 The North Downs Way heads across the A251 besides St Christopher's church and heads down the Wye Road, passing the war memorial, photo 13, on the village green. Reaching the end of the green the route continues ahead along the Pilgrims Way. Initially there are houses on the right before the road leaves the edge of the village. Just past Brewhouse Lane the path reaches the point where the route of the North Downs Way splits into two, photo 14. One branch heading off towards Dover via Canterbury, the other branch heading towards Dover via Folkestone. 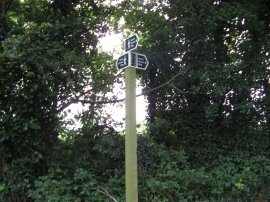 Apart from the small standard signpost there was nothing else to mark the significance of the spot in the rather gloomy lane. Here I headed down the branch towards Folkestone, primarily because between Etchinghill and Dover the North Downs Way shares its route with that of the Saxon Shore Way which I have already walked in the other direction. A little further down the road the route of the North Downs Way takes a footpath off to the left which runs along side the edge of a field, turning left and then right to take a footpath that runs across the middle of the field, photo 15, down to cross the A 28. Heading over the field I could see the tower of Wye church and, on the hillside above the town, the Wye crown which I would be passing above on the next stage of the North Downs Way as the route once again joins a path that runs along the top of the hills. Having crossed the A 28 the North Downs Way runs through the grounds of Perry Court Farm. 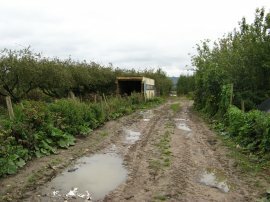 A number of the paths here were quite muddy, photo 16, and the farm looked rather run down and the surroundings could do with a good tidy up. Leaving the farm the route crosses over a couple of more fields before joining Harville Road on the outskirts of Wye. 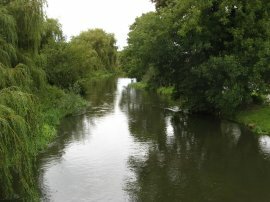 The route turns left for a short distance before turning right into Bridge Street, passing Wye Station, photo 17, where I had started my journey to Hollingbourne earlier in the day, and crossing over the Great Stour River, photo 18. Once over the river it was just a short walk to from the route of the North Downs Way back to where I had parked my car in Churchfield Way. Reaching the car the GPS said I had walked 15.0 miles. Of these 14.1 had been along the North Downs Way on what had been an easy days walking.